One of my most favourite discoveries in the Parksville-Qualicum Oceanside region is Milner Gardens & Woodland. I visited for the first time two years ago and quickly fell in love with its lush floral beds, marvelous old growth trees and charming tea house. It should come as no surprise that the summer months are some of the most beautiful at Milner. To celebrate this vibrant season in the Gardens, a number of enticing events are planned between now and the time the leaves start to change colour. Meet, mingle and be inspired as more than 21 artists transform this seaside paradise into a giant makeshift art studio. 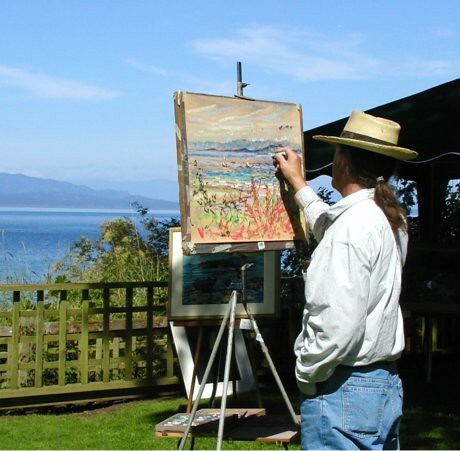 Painters, sculptors, sketchers and photographers will be displaying their creations while allowing visitors the chance to chat and ask questions. Each artist has donated a piece of art to be auctioned off to benefit the Gardens. Phil Dwyer’s Adult Jazz Intensive Ensemble swings into Milner Gardens with some of BC’s top amateur musicians. Bring your jazz hands. Joe Chindamo and Friends present “Improvisatory Fireworks as Jazz Giants Reunite” featuring Joe Chindamo on the accordion, Phil Dwyer saxing it up, Jodi Proznick on bass and Craig Scott on drums. As summer days dwindle, join Milner Gardens as they welcome The Nanaimo Tidesmen Barbershop Chorus. If you aren’t able to make any of these events, be sure to dedicate one day this summer to visit this Oceanside gem. Wander the pathways and make your way to the tea house for English tea and home-baked scones with Devonshire cream and sweet jams made from fruit that grows on Milner’s grounds. Milner Gardens and Woodland is open to the public 7 days a week 10 a.m. – 4:30 p.m. all summer long and Thursdays to Sundays for the months of September and October. Find Milner Gardens and Woodland online, connect with them on Facebook or say hello on Twitter.